The Rock-hewn Churches of Ivanovo comprise a group of monolithic religious buildings, hewn out of solid rock, that are noted for their beautiful and well-preserved medieval frescoes. The caves in the region had been inhabited by monks from the 1320s to the 17th century, where they hewed cells, churches and chapels out of solid rock. At the peak of the monastery complex, the number of churches was about 40, while the other premises were around 300, most of which are not preserved today. 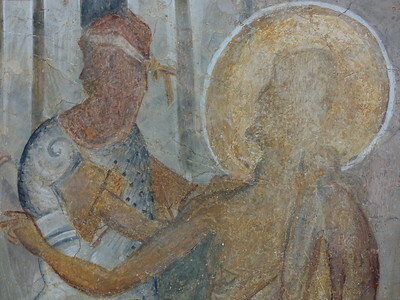 Its 13th- and 14th-century frescoes, preserved in 5 of the churches, are considered wonderful examples of Bulgarian mediaeval art. Many century-old inscriptions have also been preserved in the monastical premises, including the famous indented inscription of the monk Ivo Gramatik from 1308-1309. What is special is that there is already a WHS in the park: the Rock-hewn Churches of Ivanovo. That is our main goal of this morning. The Rock Churches comprise a complex of former monasteries, churches, cells and chapels, carved out of the rock by monks during the 13th and 14th centuries. The interior walls are covered with murals, which are regarded as special examples of medieval Christian art from this region. To visit you pass through a forest via a gradually sloping path. Along the way there are beautiful views over the nature reserve and I found it wonderful to walk here in the glorious weather. The only accessible rock church can already be recognized from a distance by its wooden extension. This seems to protect visitors from falling out of the cave chapel from a great altitude. The church itself has been roughly cut out of the rocks, perhaps it’s a widening of a natural cave. The monks used to climb in via a rope ladder along the 38-meter-high, steep cliff. Nowadays at the end of the walking path there is a narrow opening in the rock through which you can step inside. The ticket seller / guide at the door wanted to write down our nationalities - "for visitor statistics". We start to enumerate enthusiastically: Canada, Australia, Switzerland, Germany, France, the Netherlands, Sweden, Austria, Scotland ... He quickly gave up and just wrote 'international group'. He did give us 1 Lev per person group discount though. We all just fitted in the interior of the rock church - that's how small it is. That in addition to a woman who sits there all day to sell souvenirs such as fridge magnets. The guide gave us a short explanation of the murals and said that the other rock churches in the area are too unsafe/unstable to let visitors in. The quality of the murals is also less good: the ones in the main church were extensively restored between 1983 and 2002. 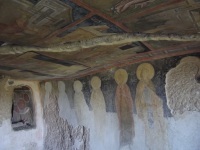 The ceilings and part of the walls are painted with biblical scenes. Especially the ceilings must have been heavy work. They are low but very uneven. In all it's pretty nice, but as with many of the other Bulgarian sites one wonders: it's so small and how special is it anyway (artistically or otherwise)? It was placed on the List in 1979 at the same time as 3 other small Bulgarian WHS. This already in the second year after UNESCO started the World Heritage List. So Bulgaria was very early and the rules about OUV and management were not as strict as they are now. Staying overnight in Ivanovo, I walked about 5 km to the site. I was not able to hitch a car because most people driving towards the site were tourists and not locals. Out of the 5 monuments, only Holy Virgin's Rock Church, which is supposedly part of Archangel Michael's cloister, is open to tourists. From the parking lot there are two ways to get to the church: one goes directly up the stairs and the other meanders leisurely. There seem to be many religious remains on rock cliffs around Bulgaria, and the sole reason this one has its OUV confirmed is because of the quality of the frescoes, I understand. But still all we see is just one little cave church. It would be so much nicer if we could visit all 5 monuments in the site. A few words about the village of Ivanovo. Perhaps because most tourists visit the site from Ruse, there are very few infras for tourists in this village. No ATMs to begin with. There are 2 hotel-restaurants, one of which was closed when I was there. (I had a reservation with the other one.) The restaurant where I had dinner didn't have everything listed in the menu. But because only locals usually eat here, it was extremely cheap. A glass of impressive red wine from Razgrad, Bulgaria, was only 0.4 Euros (40 cents) there! 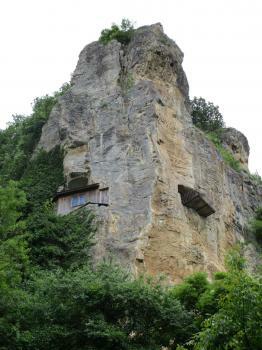 The only rock-hewn church open to the public is the church of Archangel Michael. By visiting on a Sunday I found that there were a number of other visitors climbing the steep path up to the cave entrance, but only a few were admitted at a time. The colours of the ancient frescoes on the walls and ceiling are still vivid. I reached the site by train from Ruse to Ivanovo, from where it was a 5km walk down into the gorge of the Lom River to the site. If you are doing a tour of Bulgaria and are in the Ruse area then the Rock Churches of Ivanovo are worth trying to fit in. Their cliffside location is quite impressive (see photo – the main caves are behind the glass window in centre) and the murals are interesting for their realism (no photo as Els only allows 1 photo per reviewer but the UNESCO site photo gives an impression of how they cover the walls and roof!) If you are visiting monasteries like Rila as well you may get a bit overwhelmed with murals unless you are an “expert” but these in some way act as a nice counterpoint to those in the full sized monastery!